This will be basic for you pros, please forgive me. I have been paying the minimum balance on my student loan all year, but the balance shown on the site has barely gone down. I assumed that this was because they make you pay the interest first, then the principal. However, when I looked at the payoff amount, it was about the same as the balance! How is this possible? While it's common to think of it that way - pay off the interest first, then the principal - that's not actually how your payments work over time. It's true of any one payment, though. Interest is earned over time. It might be added on daily, weekly, monthly, or any other frequency. For simplicity's sake, let's assume it is added 1/12*(apr) once per month. So you have a 6% loan, starting at $10,000 principal balance. That's 0.5% per month (6%/12). So each month, you owe .005*(principal) in interest. Any amount you pay over $50 per month, either as part of your payment or as extra (and extra designated to go to principal - an important distinction), will lower that principal. That's what actually pays off the loan. You'd then pay $100 again, with now $49.75 paying interest and $50.25 paying principal. The reason people think of this as paying interest first, is in particular with some mortgages and longer term repayment plans the far majority (commonly 80%, but in some cases higher) of each payment is allocated to paying the interest on the loan. The way these plans work is that you have a fixed monthly payment for, say, 30 years - but that's at first nearly entirely interest, because you don't have to pay much principal off to eventually get the loan paid off. 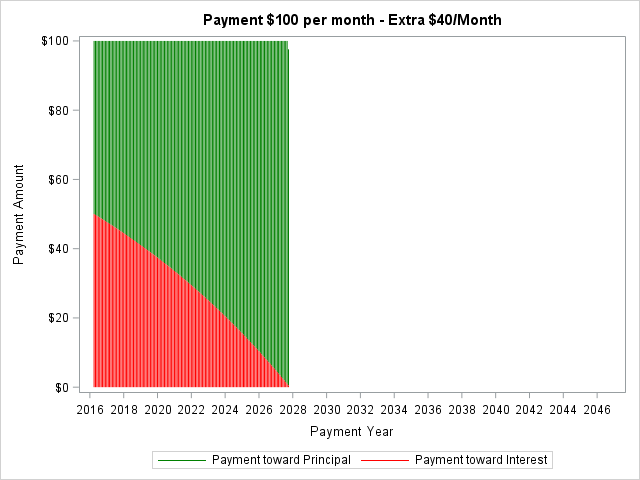 For example, to pay off that loan in 30 years, you'd only have to pay $60 per month - $50 for interest initially and $10 for principal. 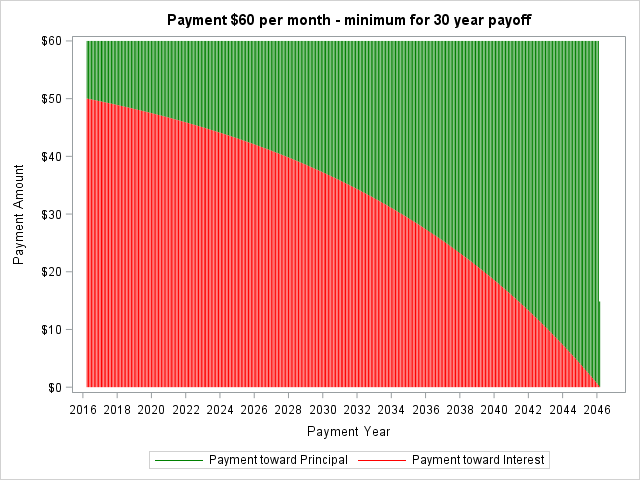 Since that principal will slowly rise over time (as interest slowly drops), you end up paying it off. (30 years is 360 payments, or about $21,600 - so you're going to pay a lot of interest this way, of course, over 100% interest over the life of the loan). Since you're only paying $10 to principal each month to start with, if you add even a small amount to that payment, you pay it off far faster and pay far less interest. 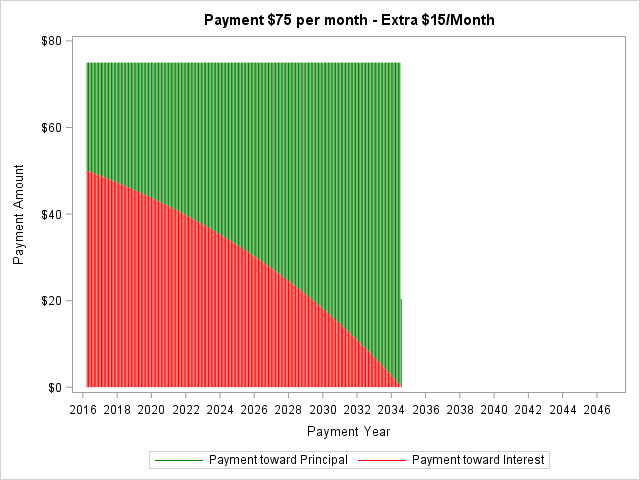 Add $15 to your payment - $75 instead of $60 - and now you're paying $25 to principal instead of $10, meaning you now pay it off in 18 years at that payment structure and pay only a bit over $16,000 in total - saving nearly half of the interest. Add $40 ($100 per month) and you now pay it off in closer to 10 years, and pay $14,000 in total. Even just add that for the first few years, and you'll dramatically increase your payoff rate. I recommend using a mortgage payoff calculator, like this one which I set up with the above loan, to see how things work out. It shows you the amount going to principal and interest each year, and lets you alter the payments to see how they affect things. Here are charts of the three options, so you can see visually how your payments break down. Like above, this assumes interest is calculated and capitalized monthly (which may be an oversimplification for your loan, but it doesn't change the numbers much).